This is an exact replica of the helmet worn by Ayrton Senna in the 1988 Formula 1 season. 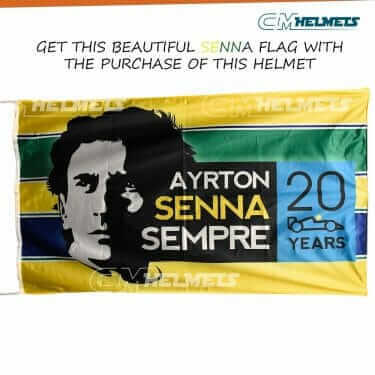 After three years of learning at Lotus and cementing his status as one of the most talented drivers on the grid, Senna elected to make a little tweak to his helmet from 1987 for his first year with McLaren. The Brazilian left the gold yellow of 1987 behind and chose a paler yellow as his livery’s main color. In a terrific 1988 campaign for McLaren-Honda, in which the team won 15 out of the 16 races of the year, Senna beat his teammate Alain Prost and won his first championship in Formula 1, achieving eight wins and 13 Pole Positions.